So here we are at week three of the One Room Challenge. You know the rundown. One room, six weeks, lots of bloggers to check in on all hosted by Linda of Calling It Home. I'm kicking my living room into shape. I absolutely adore this rug but this wrinkling business drives me nuts. We often eat in our living room and the large coffee table gets dragged back and forth quite a bit. This causes the rug to be pulled in weird ways which results in wrinkles (and is probably terrible for the rug). I ordered a 100% wool rug pad to address this issue (right now there's nothing between the rug and floor). It is coming from the East coast and should arrive any day. I ordered wool because the synthetic ones off-gas and I'm not into that. I paid a little bit more for wool -$175 for a 12x14 but no tax and free shipping. It should feel great underfoot. The second thing I wanted to address were the cushions on these chairs which are too big and don't look right to me anymore. How I ended up with inserts that are so poofy and ill fitting is sort of beyond me but they are so I'm using this ORC to fix this. So not only do the super-sized cushions look no bueno but also the fabric on them is super faded (hello southern exposure). Silly to make new covers on lame inserts, so I'm doing all of them over. I had the seat cushions made from an internet source with 5" foam wrapped in feathers/down (they've arrived and look fantastic). I am going to make the down backs myself by recycling the feathers from the existing cushions (gonna be messy and I will do a separate post about this process). I'm still waiting on my fabric to make the covers. The third super sloppy element I'm fixing is this business. I made this couch topper a while ago as a way of making this couch a little more kid (specifically Kit) proof. Problem is it's not big enough and gets all rumpled and I'm sick of primping it. It is the wedgy of couch covers. How I'm going to deal with this is still TBD. Truth told, the couch cover is washable and pretty much anything short of indelible marker bleaches out so I could go with nothing and do more laundry or I can try a new system of covering the bottom cushions. We'll see. I'll use the old couch topper as a dog bed for Calvin. I still have a long way to go on this room but I feel pretty satisfied about finally addressing these existing design flaws (good design should address form and function, IMO). Click away for weeks one and two. And head on over to Calling it Home to see the adventure of all the other projects here and here. I can't be the only one who is bothered by a wrinkly rug, right? Let me know what bugs you in your home. Love that rug--though it would be dangerouse with me and my innate gracefulness. (ahem.) That couch would have me bonkers: the back cushions. By the by, in my husbands family, it seems the thing to do with you couch rug/blanket is to fold it over the bottom cushions. Makes no sense to me: but there's your precedent. Looking forward to seeing the feathers fly. I've stopped seeing my home from a design point of view. Its a phase...i'm sure. I just want it tidy. I am picking up after my man and two boys all day long. Encouraging them to get with my system of putting things away for themselves. anyways... we are decorating the master - old curtains, new rod, new dressers, old art, new giant mural needs to happen but relying on contractor to help me make a 5x10 foot frame. the couch for the cottage was recovered in blue. it's sloppy down couch and OMG this lady perked up the pillows and made everything look tight!!! post coming soon! wrinkly carpets are no bueno. can you put your coffee table on tiny casters?? I adore that rug. I think the wool pad will help. I also adore 'the wedgy of couch covers' comment. Funny. Funny. I say go with the plain white couch cover for a bit and see how much maintenance, ie time btwn washes, that it really requires. Rug wrinkles drive me nuts, but with a rug that pretty, I'd deal! Glad you found a solution. Those chair frames are gorgeous too! What drives me nuts about my house? The never-ending maintenance! It'd love to just to fun projects instead of all the must-do stuff!! I can't wait to see the cushions and fabric you selected. And hey, how did the doors turn out?! Wrinkly rugs definitely drive me nuts so I totally get it...I think the rug pad will definitely help. 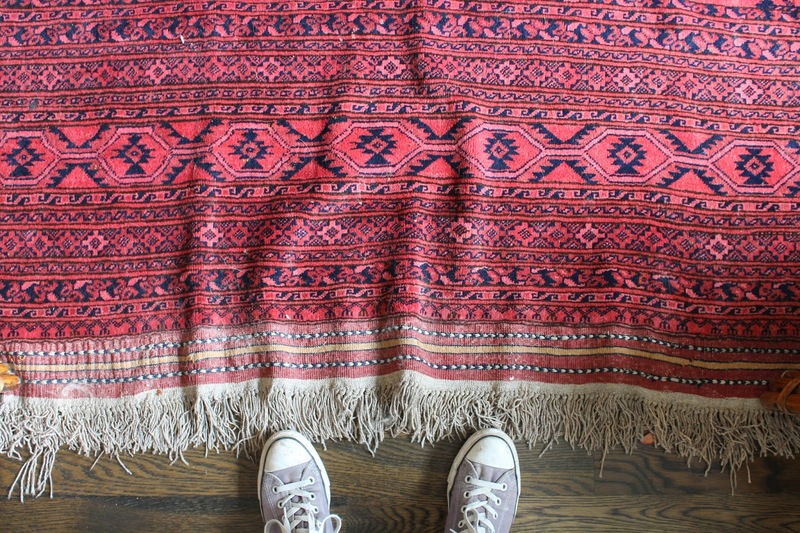 It's a gorgeous rug so worth the fix etc. And speaking of, those chairs of yours are so fabulous...can't wait to see the new cushions! I have that problem with one of my rugs too, but it's over a carpet. Do you think a rug pad would help in that case? Whoa I'm obsessed with that coffee table. Buy/DIY? Can we get a close up in the room reveal? Yes the tucked blanket is a good trick -it may be employed. Some feathers did fly a couple of days ago. I think my neighbors might be wondering what the heck is going on in my yard. I wish. maybe we need to stop eating in the LR like couch potatoes so I don't have to move that table any more. About that master....Can't wait to see it in it's finished incarnation. Same goes with the bathrooms. No pressure though, lol. Thanks Traci. They belonged to my grandparents. I LOVE them for that reason alone. I hear you sister. The doors look great. I was chicken and repainted them white. Someone had suggested black which would have been tre ballsy. They look great but man what a load of work! Thanks Christine. Hoping to return those chairs to their mid-century glory. I have pics of them from the 60s when they belonged to my grandparents. The cushions used to be much slimmer so I'm shooting to bring that look back and still keep them comfortable. :) You're tooooooo nice. Your pad ain't bad either. My in-laws had some pads they used for persian carpets over wall to wall (which worked) so I know they exist but don't know what they are called. Yes, for sure. I bought it from the shabby chic store before they filed for bankruptcy in 2008. It's made from old shutters. I love it because it is virtually indestructible.